The evidence is mounting that I am unprepared for the impending teenage years. Also happening is an acute sense of dread for those same years. Last week Riley had a band concert and a softball game on the same day. Initially we thought the band concert would run long enough to prevent her from making it to the softball game. Because of this initial impression, Rye went ahead and planned some after concert activities with her band friends. These plans were reinforced by the band director who, impressed by the kids’ performance, suggested the kids all be taken to Menchie’s for frozen yogurt. Menchie’s is the cool new place to go. Okay, a few things here. First, the kids don’t need help from authority figures to nag their parents to go get Menchie’s. The proficiency at which they nag us for Menchie’s is only rivaled by the ability of East Germany to cheat at Olympic women’s weightlifting. Second, our initial observation that the concert and softball would occur concurrently was flawed. This meant we had time to get Rye from the concert to her game before she missed much. Note to self as I prepare for the teen era: Rye doesn’t like surprises or changes to her plans. Let me set this up for you. Right after the fourth song, Rye has a sax solo. A sax solo I missed despite fracturing a few traffic laws as Bails and I sped from her softball practice to the concert. Concert goes well and unexpectedly fast. So I take Bails and Kinz home and get Rye’s softball stuff ready to go. Mom gets home with Rye shortly after us. And Rye is in tears. Big ol’ fat tears! She’s whining about not being able to go the Menchie’s, stomping through the kitchen and pretty much doing a decent impression of a moody, emotionally volatile teenage girl. This did not please me and it took nearly every bit of self control for me not to give her the verbal equivalent of what the 49ers did the Broncos in Super Bowl XXIV. So she does what teenagers have been doing for centuries when they don’t want to do what they’ve been told to do. She mutters comments under her breath while stalling and whining. Like Chris Matthews on election night 2010. She grumpily gets dressed for softball. At one point in the truck on the way to her game, she dropped a couple of comments about unfairness and how she didn’t even like softball. 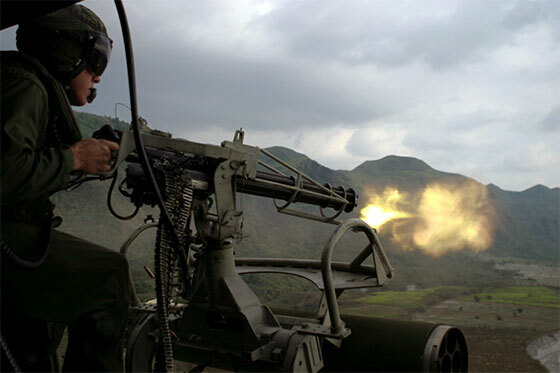 Have you ever seen what a M134 minigun can do when its fire is concentrated on a target? The only thing preventing this from happening to Riley was Mom giving me the “stay calm” look. We make the game, Rye plays well even though she doesn’t get a hit, and by some oddly enough even seems to have a good time. After the game she gathers her gear, jokes with a few of her teammates and asks if she can get something at the snack bar. And it was in that “What, you’re still mad about that whole meltdown thing I did an hour or so ago?” tone. The emotional me-first crap rampant in teen behavior is going to kill me. I swear to the Dear Lord above I’m going to have take up kick boxing or learn how to use explosives in order to alleviate the stress and pressure. The worst part? We think Riley is the most reasonable and grounded of the three girls. So witnessing this meltdown over frozen yogurt gave us a short but clear glimpse into our future. I suspect it was the same sinking feeling that Luke had when he discovered that the Emperor had intercepted Han and Leia’s strike team on the Forest Moon of Endor and that the deflector shield would be quite operational when the Rebel fleet arrived. So…I kinda feel like I did when the girls first came home as babies and we were completely going on instinct and trial and error. Just when you kinda think you got some things figured out somebody gives you the wrong instruction manual. I mean I feel like somebody gave me the sound track to “The Last Days of Disco” on the way to a Poison and Def Leppard concert. Going to that concert this summer by the way. Just saying. Her team lost their first two games by a combined 14-3 and she struck out in all four of her at-bats. So after game #2 she’s crying on our way back to my truck. She gets in in the passenger side and she’s taking slow deliberate deep breaths trying to get a handle on the crazed fury about to unleash itself. Unsuspectingly, I get in on my side and made the typical Dad mistake of downplaying her disappointment. What happened next burned what little hair I have left off my head. So it was right here when I realized exactly how Indiana Jones felt when Belloq sealed him in the Well of Souls with all those snakes. Trapped…in the truck with a blond, 4th grade, enraged wolverine sitting in the seat next to me. Well, I decided to stick with instinct…and since I kinda had already had it with the meltdowns…I told her to stop feeling sorry for herself, be tougher, and get ready for her next game. We’d do some practicing on our own and she’d be ready to go. That, along with what I can only assume was exhaustion brought on by the breakneck speed at which she delivered that rant, calmed her down long enough so she could get a shower and go to bed. So all I’m saying is sometimes getting a glimpse of the future isn’t really a win. So Mom was back in Denver last week. And Grandma was back at the house helping me out. Monday through Thursday this time. And before anyone leaps to any conclusions or engages in any conjecture, its was awesome having her here. Again. She not only assumed the role as parent taxi driver – gymnastics, gymnastics and softball Monday and then softball and softball on Tuesday. Wednesday was an off night and then dance on Thursday. Bus was a little late to dance but that was the bus driver’s fault, not Grandma’s. She also did some cleaning, dusting, laundry, made some subtle decorating changes, moved some things around and repotted a plant. About the only thing she didn’t do was hang some shelves so I could display the rest of my NFL mini helmet collection which has been carefully altered so they look like did in 1976. Am I the only one who thinks the Seahawks need to go back to their original colors? I didn’t really mind either approach as long as we got to watch Katherine Jenkins. 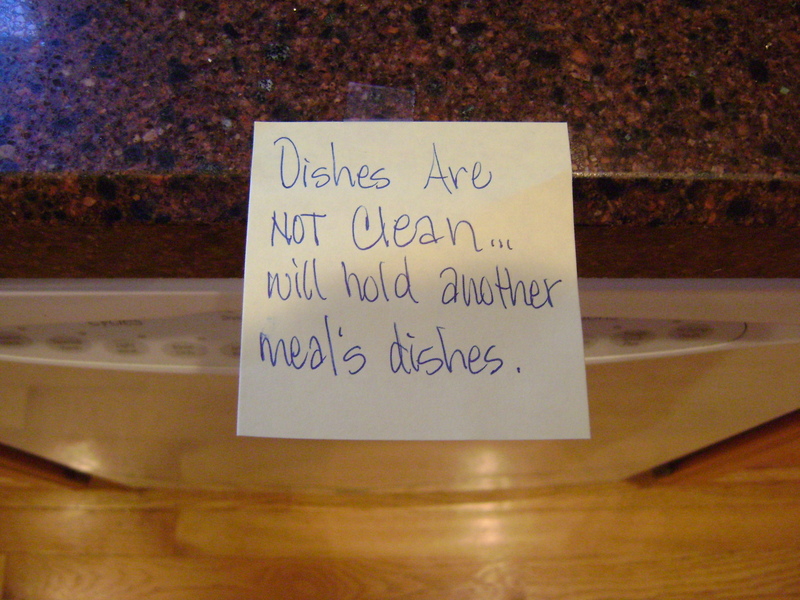 Without the note my course of action would most likely have included me putting the dishes into the dishwasher until it was full. My tip off to it not being full probably would be when I opened it up and noticed that there was more room for dishes. I’m pretty sure that there isn’t any Predator-like light bending camoflauge that would have prevented me from noticing if the dishwasher was or was not full. But…I appreciate the note. First, the chicken and rice casserole was freaking awesome. Chicken, rice, cheese, probably some other stuff…awesome. 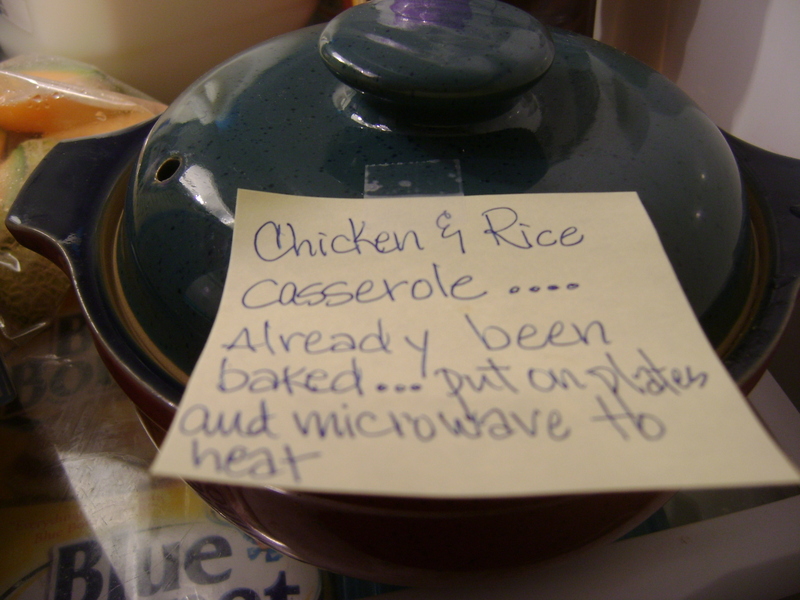 Second, I’m not sure why she felt the need to let me know that it was already baked. I mean if there had been some raw chicken cubes and shredded cheese and some uncooked rice sitting in the dish, I probably could have used experience and instinct to determine that it was in a state of non-bakedification. But I appreciate the note. Over the weekend we flipped roles and went to Grandma’s house for Easter. 51 people at Easter Dinner. One of my brothers-in-law put up his tailgating tents in the backyard so everyone would actually have a seat. Not kidding. We like going to Grandma’s house for Easter even if there are going to be 51 people there. But one thing I don’t like is golf. And it was Master’s weekend which means Grandpa and my two brothers-in-law spent a lot of time watching it. I don’t get it. I know this makes me an outlier among politically conservative Dads with libertarian streaks. But it’s just the truth. Watching golf on TV might among the most mind numbing activities I can think of. It’s like watching English scholars dissect the secondary effects of the Anglo-Dutch wars in the 17th century. Kinsey wakes up with a fever. Crap. I guess I’ll call and make a doctor’s appointment for her and Grandma go through the whole routine again. I’m out the door to work while Grandma is home with a still sick Bailey and newly sick Kinsey. Then she texts me that the doc just phoned in the prescription and she’ll pick it up later. She also let me know that Syracuse’s center Fab Melo is out for the tournament and that I might to adjust my bracket. Things went pretty well the rest of day. I got home at a decent time so Grandma could head back home at a reasonable hour. That same reasonableness wasn’t extended to Mom’s return flight which landed at 10:30. Thankfully, the airport is only about 20 minutes away so I left the girls at home. They slept. Didn’t even know I was gone. Mom’s flight is right on time. Unfortunately her baggage wasn’t. About 45 minutes later she finally makes it to my truck. And, listen, this is the Des Moines International Airport not O’Hare. Although not sure why we have international designation. We must get a flight from Canada or something. Anyway, getting your luggage is usually like running into the gas station to get fountain pop. In, out, done. So back to airport pick-up duty. I can make a relatively tight loop from the pick-up lane around the parking garage and back. I could probably do it in under a minute if homeland security and traffic laws were optional. I must have made about 26 loops. But Mom got home and that’s good. Plus everybody went to school on Thursday. Also good. Crap, Bailey’s fever, while no longer inducing episodes of freakiness, still appears to be winning. Double crap, we’re out of ibuprofen and acetomenophin. Crap to the third power, I think I slept about 14, maybe 15 minutes. Total. So my decision making capabilities aren’t at optimum levels. Evidence? Well my usually reliable, although not foolproof, “praying to God that a fever miraculously goes away” strategy appears to have failed. So she’s staying home from school. That’s bad. But Grandma’s here. That’s good. But she probably has strep. Bad. Which means she’ll need to go to the doctor, get a prescription and then stay home on Wednesday. Also bad. Doctor’s office also won’t make appointments until 8:30. More bad. So that’s how Tuesday morning started. After getting the other two out of bed and moving, I remember that Tuesday is band day for Rye. Normally that means just dropping her off at the 9th grade building by 8. So at roughly 7:45 Rye tells me she forgot her saxophone at school so we’ll need to run by her school and pick up the sax before we drive to band practice at the 9th grade building. Also I learn that Kinz forgot to do her geography homework. Homework that her teacher told us she was struggling with and therefore I made it a big deal to spend some time getting right. Oh and I need to stop and pick up some more ibuprofen and acetomenophin before work. And I need to actually the make a doctor’s appointment for Bails. Which can’t happen until 8:30. Springing into action I engage my parental superpowers. Superpowers honed over a decade. I help Kinz figure out the river which forms Oklahoma’s southern border and in what mountain range the Smokey Mountain National Park is located. I leave her on her own to get the last few done and tell her that I’d be right back after dropping off Rye and grabbing some medicine. We fracture a few speed limits on our way to Rye’s school, she’s coaxes the janitor into opening up the band room and she grabs her sax. A couple minutes later she does a tuck roll out the side of my truck that would have made the Navy SEALS proud. I rush into Walgreen’s make a couple cuts that would have made Gale Sayers and Barry Sanders gasp in amazement, grab the medicine and head home. Upon entering the kitchen something appears to be missing. I yell up the stairs to Grandma asking her where the heck Kinsey went.